Vogue Australia has published a series of beautiful images of the newly renovated Ovolo Inchcolm hotel in Spring Hill, Brisbane with audiovisual installations by JVG Sound. The gorgeous photos capture the essence of the heritage building being class and elegance with an unmistakable kitsch flair. The building was originally built in the 1920’s and has become a place where old and new can coexist and compliment each other to create a truly unique hotel experience. 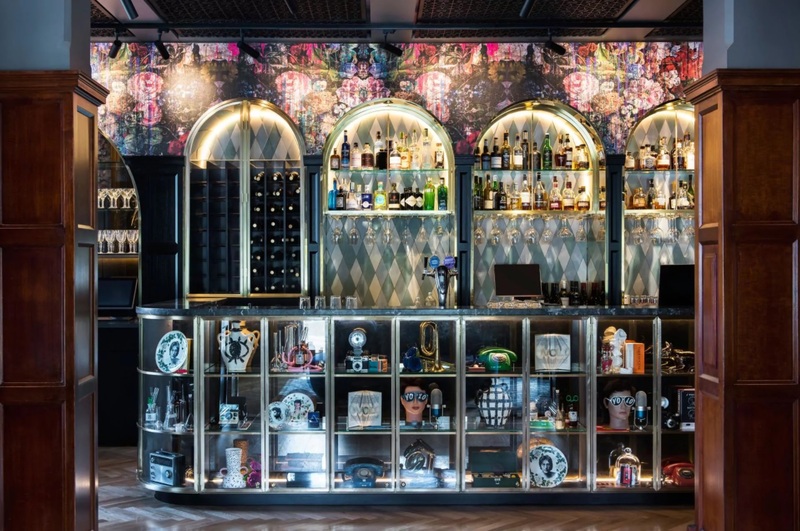 The acquisition of the Inchcolm Hotel by the Ovolo company inspired a fresh start with a reinvigorated interior design, brand new restaurant Salon de co. and a restoration of the sound and visual elements in the public areas. Yeong Sassall for Vogue reports that the designers from Hassell were inspired by Gertrude Stein and her studio in Paris which was filled with objet d’arts, free-flowing wine and varying styles of artwork (which is evident in the hotel’s ‘Cabinet of Curiosity’ that is littered with early-to-mid 20th century objects like Bowie printed plates and vintage medical prescriptions), creating an eclectic mood that inspires and intrigues. “Given the interesting history of the building, it was important that we brought the vision for Ovolo Inchcolm to life in a way that played on its existing charm and heritage, such as maintaining its original silky panels, which you’ll notice throughout the hotel” – Interior design lead for Hassell, Shelley Gabriel. in the common areas such as Salon de co., reception and function rooms. For your next audiovisual project, call the professionals with over 20 years of experience, JVG Sound.